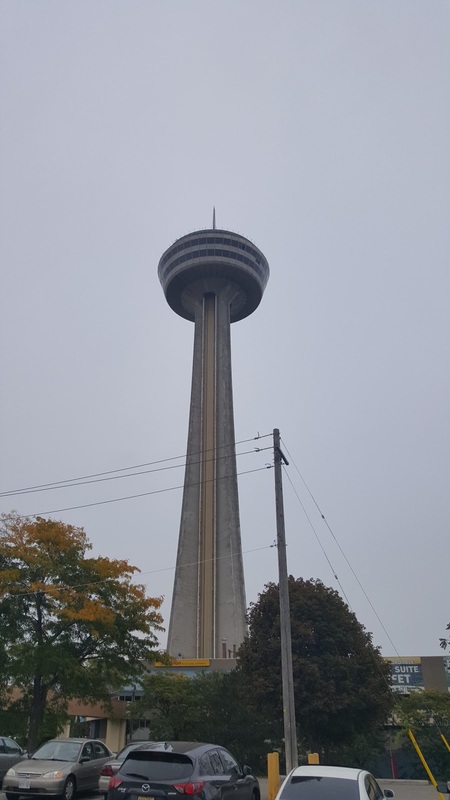 We had dinner tonight atop the Skylon Tower. 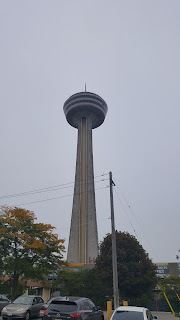 It's much like the CN Tower in that it's a slipfoam tower and that there's an a la carte fine dining experience that revolves and there's a less formal non-revolving dining option. Again, we went with the non-revolving option, mainly because the buffet sounded so good. And it's not bad. It feels like a mid-level Vegas buffet. There's an IMAX theater in the complex, but I don't think it plays mainstream IMAX releases. There just seems to be a feature about Niagara History. But, there's also a daredevil exhibit, and that's pretty cool. Clifton Hill itself is a neat little tourist trap. There's so much to do that we couldn't possibly do everything available there. Much of it is cheesy, most of it is expensive for what you actually get, but all of it is fun if you're in the right mood. Keeping that in mind, if you're souvenir hunting, don't bother buying them in Clifton Hill. You're better off picking them up in the actual town of Niagara Falls or Niagara-on-the-Lake. Speaking of Niagara-On-The-Lake, if you take a scenic drive to along the river from Niagara Falls to Niagara on the Lake, there are a ton of wineries along the way. You could spend a few days visiting every single one. But, it's best to book a winery tour if that's your thing so that you can sample as much wine as you like without having to worry about being sober enough to drive to the next winery.